How do you get a Free Upgrade at Sandals Resorts? What’s included at Sandals Resorts? Is liquor included at Sandals Resorts? When is lobster on the menu at Sandals? Are Sandals Resorts adult only? How does tipping work at Sandals Resorts? Do the Sandals Resorts specials really end when that clock runs out? What's with this 65% Off Sandals Resorts? How to get a Free Upgrade at Sandals is one of the most searched term on the internet. Our Free "Sandals Insider Resort" discusses free upgrades in depth. Download your copy here. If dining on unlimited lobster is one of your favorite things, then be sure to travel to Sandals Resorts when lobster is in season or you will be disappointed! Sandals makes it a point to have lobser on the menu during months when lobster is permitted. BARBADOS: no closures- Lobster All Year- Yea!! Are Sandals Resorts adults only? Sandals is couples only. The only bed arrangements are one King size bed. All rates are per couple, so no single or triple rates. If you are with group you can request a single rate, usually a 25% discount for only one person in a room. “Couple” can be can be any two persons . Beer is included at all Sandals Resorts. You will find different brands of beer depending on the resort and island. Click here for the beer list. Unlimited liquor is included at Sandals Resorts. This inlcudes top shelf brands. Click here for a liquor list. Team members are not allowed to accept tips and can lose their job if they do. (Butlers excepted). The clock you see on the Sandals website does run out. Often it just restarts and the specials and discounts stay the same and new clock starts ticking down. But, and a big but, the specials and discounts do change from time to time. This can cost you thousands of dollars if you wait, especially if a 65% discount changes to 55% of 50%. 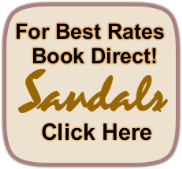 It is too complicated to go into here, but a full explanation of how sandals pricing and percentage discounts work is included in our Free Sandals Insider Report. Click here to download your free copy.